The City of Redding Planning Commission has approved a proposal to build another mixed-use building in downtown Redding. 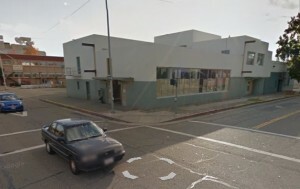 The Redding Greyhound Depot circa 2011, courtesy of Google Street View. Parts of the Greyhound station date back to at least 1945.
past January, they have applied for (and were granted) permission to raze the structure and build a new building that better embodies the principles of New Urbanism. The new building is designed by Scott Gibson of Chico, who also designed the lovely mixed-use building across from the Redding Civic Center on Parkview Avenue. The new two-story building will house over 25,000 square feet and feature apartments and offices on the second floor. The new building will be twice the square footage of the old station and eliminate an empty bus staging and parking area facing Pine Street, another positive step towards enhancing the built environment of that major thoroughfare. This comes on the heels of the four-story mixed-use building built by Brent Weaver one block south. According to the Record-Searchlight, construction could start as early as June of 2013 and take six months to complete. The full City of Redding staff report with architect’s sketches of the new building can be found here.